DIAL: Black matte dial with luminous hour markers and tachymeter on the periphery. Two subdials, subsidiary seconds at 9 o’clock and chronograph 30-min counter at 3 o’clock with red 5-minute countdown sector. Broad Arrow hour minutes hands, silver central chronograph seconds hand and dagger counter hands. CASE: 38mm, great condition stainless steel case, black bi-directional 60-minute bezel. Screw-down case back, signed Croton Watch Co. CONDITION REPORT: The dial is in mint condition and the luminous indexes have aged evenly with a nice patina. The case is in original and unpolished condition with sharp edges. The watch is in great original condition and functioning properly. NOTES: Nivada Grenchen is a Swiss watch company founded in 1879 in the town of Grenchen, Switzerland. Grenchen is the same town where several watch manufacturers were also established, including Breitling SA, ETA SA, Fortis, Eterna SA and Titoni Ltd. Very little information is available on these ultra-rare timepieces, which also makes them highly collectible. 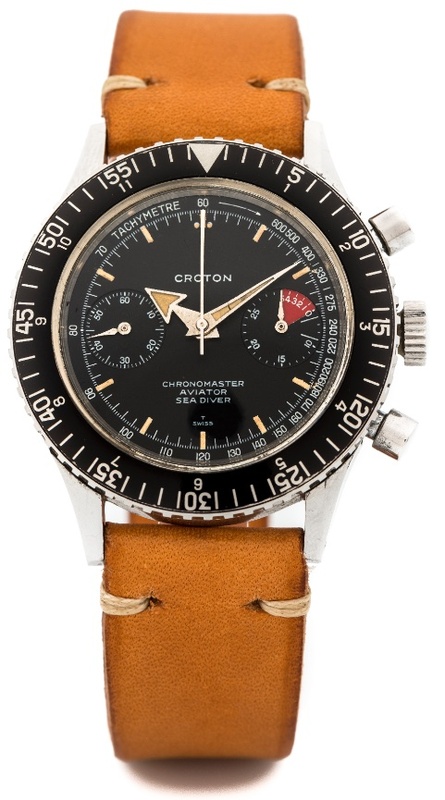 Croton was the US name found on Nivada Grenchen watches.